Since its final episode aired in 2008, HBO's acclaimed crime drama The Wire has only become more popular and influential. The issues it tackled, from the failures of the drug war and criminal justice system to systemic bias in law enforcement and other social institutions, have become more urgent and central to the national conversation. The show's actors, such as Idris Elba, Dominic West, and Michael B. Jordan, have gone on to become major stars. Its creators and writers, including David Simon and Richard Price, have developed dedicated cult followings of their own. Universities use the show to teach everything from film theory to criminal justice to sociology. Politicians and activists reference it when discussing policy. When critics compile lists of the Greatest TV Shows of All Time, The Wire routinely takes the top spot. It is arguably one of the great works of art America has produced in the 20th century. But while there has been a great deal of critical analysis of the show and its themes, until now there has never been a definitive, behind-the-scenes take on how it came to be made. 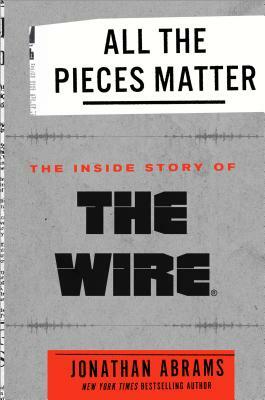 With unparalleled access to all the key actors and writers involved in its creation, Jonathan Abrams tells the astonishing, compelling, and complete account of The Wire, from its inception and creation through its end and powerful legacy. JONATHAN ABRAMS is an award-winning journalist who writes for Bleacher Report. He is the author of the New York Times bestselling Boys Among Men. He was previously a staff writer at Grantland, the Los Angeles Times, and the New York Times and is a graduate of the University of Southern California. “The Wire has thoroughly saturated popular culture in a way few television dramas ever have. In their own words, the people involved have given Jonathan Abrams a look at how it happenepd. You come at a show like this, you best not miss. Abrams doesn't.”-- Charles P. Pierce, author of Idiot America.